Men’s street style is not only a vibrant hub of bold, practical and brilliant sartorial choices, but a diverse force of fashion to be reckoned with. You see, the result of these carefully curated style decisions aren’t designed to benefit solely male fashion devotees, rather they set in motion style principles that are relevant to us all, acting as a palate cleanser for what is to come. As genders, communities and cultures move towards common ground – a ‘multi-localism’ if you will – the trends defined as ‘men’s’ or ‘women’s’ are increasingly fluid. 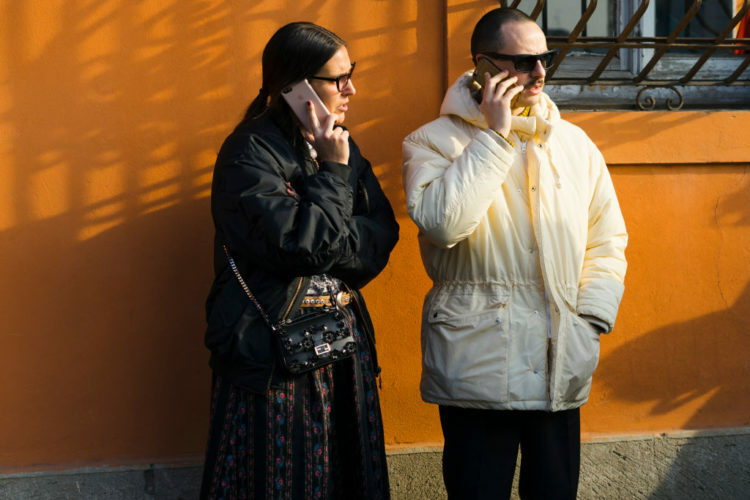 So whether you’re seeking to take notes for the coming chill, or simply want to keep your finger on the pulse of what’s trending, there are some notable cues worth remembering from the street style at Men’s Fashion Week in Milan. 1. Same, same but… less: The eccentric maximalism made popular by designers like Gucci and Dolce and Gabbana is still noticeable, but it’s toned down with plaid coats, collegiate-cut cotton drill trousers or turtlenecks worn underneath in shades of black, beige or navy. 2. Just add chill: Master the art of layering – coats over hoodies, denim over knits, prints on textures and embellishments on accessories; the sky is the limit. The general idea is to create a silhouette of volume. Building on the principles of Gorpcore, high-low items are paired with retro pieces and conflicting textures. 3. Going somewhere: Relaxed and oversized sweatshirts, trackies and off-duty athletic pieces aren’t going anywhere. On the contrary, the covetable youthful vibrancy of brands like Kenzo, Opening Ceremony and Balenciaga give the illusion that the wearers are the ultimate globe-trotters, further suggesting that cool people are always on the move. 4. Science friction: The Matrix is having a revival with high shine leathers and PU gaining traction. Avoid looking like a biker with considered sunglasses and headwear. The slimmer the better. 5. Merch ado about nothing: Enter the rise of the branded scarf seen worn in a number of street style images. Multi-coloured or emblazoned with large text, it’s time to resurface the merch you bought from that winter vacation you took in the 90s. Carpe diem.